Boone Central senior Jaime Kennedy was among Albion News area basketball players recently honored for their play during the 2011-12 season. Kennedy was named to the Class C1 All-State Second Team by the Omaha World-Herald and Lincoln Journal-Star, and was also selected to the Grand Island Independent All-Heartland Super Squad Team. Sophomore Kaylee Jensen of Lindsay Holy Family was named to the Class D2 All-State First Team in the World-Herald and Journal-Star and senior teammate Andrea Weeder was an All-State selection by the World-Herald and second team in the Journal-Star. Cedar Valley junior Skyler Erickson was a Class D1 All-State pick in the Lincoln publication and was named second team by the Omaha newspaper. Erickson was also selected to the G.I. All-Heartland Super Squad. Senior Jenna Lehmann of Boone Central was an All-Heartland Second Team selection by the Independent, while a large number of area standouts received all-state honorable mention by coaches’ nominations. 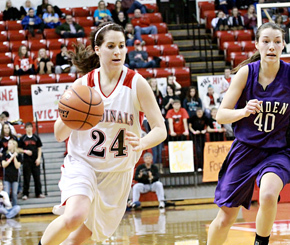 Kennedy, a 5-foot-10 senior guard, was one of Boone Central’s leaders during the Lady Cardinals’ record-setting 25-3 season that concluded with a third-place finish at the 2012 Nebraska Girls State Tournament and was recognized as one of Class C1’s elite players by the Omaha World-Herald and Lincoln Journal-Star. Kennedy was Boone Central’s second-leading scorer during the campaign (11.1 ppg) and topped the Cards in assists (4.1), steals (4.7) and 3-point field goals (56). She was also second in rebounds (5.2) and blocked shots (32). Kennedy’s all-around play was cited in her selection to the G.I. Independent All-Heartland Super Squad (all classes). Fellow Cardinal senior Jenna Lehmann, 6-foot-2 center, was named to the All-Heartland second team for her efforts this past season. Lehmann led Boone Central in scoring (12.5), rebounding (6.4), blocked shots (55), 2-point field goals (143) and free throws made (64). Boone Central also had several players receive Honorable Mention in all-state voting by coaches’ nominations. Lehmann, seniors Britany Seda and Emily Carder and sophomore Jade Gottier were among those receiving honorable mention by the World-Herald. Lehmann and Gottier were part of the Journal-Star honorable mention list, and Gottier and Seda were G.I. All-Heartland honorable mention. In boys all-state selections, Boone Central had several players receive honorable mention. Senior Brett Temme, junior Beau Bremer and sophomore Tyler Hedlund were among those on the Omaha World-Herald list, while Bremer and sophomore Derek Gentrup were honorable mention in the Lincoln Journal-Star.